Managing your pet's pain is one of our highest priorities. Pain management begins with determining the location of the pain, and then using diagnostic tools to confirm the cause. It has been shown again and again that pain impairs healing and, more importantly, is inhumane. We place utmost importance on your pet's comfort and well-being. Allowing an animal to suffer pain is, in our view, unethical. 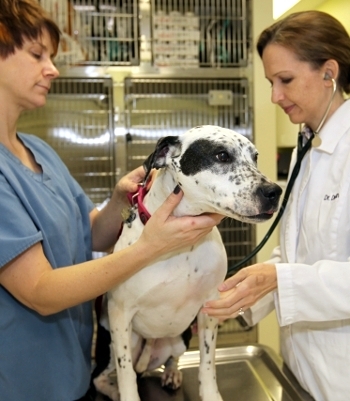 At Citrus Veterinary Clinic, we have many strategies for controlling pain. These can include oral medications, injections, constant infusions, nerve blocks, regional analgesia and sustained release pain patches. Many of these methods are included in the cost for routine surgical procedures. All of these methods are considered for every case, every time. Osteoarthritis, one of the major sources of chronic pain for older animals, is a prevalent part of pain management at our practice. Although these medications are, generally, very safe and very beneficial to our patients, some of these medications do carry risks for some patients. Your doctor will weigh these risks when indicated and be sure to discuss them with you.